C & C Heating and Air is proud to serve the Crockett community! About Crockett, TX - Happy to be your hometown Heating & Air Conditioning Contractor! Crockett is located in East Texas, approximately 150 miles southeast of Dallas and 120 miles north of Houston. Founded in 1837, Crockett is home to a population of more than 7,000 residents and is the county seat of Houston County. The city was named for American frontiersman and politician, Davy Crockett, who is said to have camped nearby on his way to the Alamo in January of 1836. Crockett is served by the Crockett Independent School District and is home to the Angelina College Career and Technical Center, a regional vocational school that offers general education transfer courses for degree programs, as well as occupational and certificate programs for a variety of career paths. Crockett is a great place to work and do business. The city’s solid economy is supported by more than 400 diversified businesses and a friendly progressive business climate that continues to draw new residents and businesses to the city each year with attractive business incentives such as build-to-suit properties, city and county tax abatements, and relocation assistance for employees and equipment. Crockett’s fabulous temperate climate provides the perfect weather for enjoying the numerous opportunities for year-round outdoor sports and recreation that dominate the area. The city is located just minutes from Houston County Lake, a 1,282-acre recreational lake that is a popular destination for anglers, who come from miles around to fish for bluegill, redear sunfish, and largemouth bass. Davy Crockett National Forest is located just ten miles east of the city. The lush forest features more than 160,000 acres of woodlands, wetlands, and waterways that offer excellent fishing, boating, hunting, camping, hiking, biking, and horseback riding. Popular designated recreation areas within the forest include the Big Slough Wilderness Area, Piney Creek Horse Trail, and Ratcliff Lake Recreation Area, starting point for the Four C National Recreation Trail that takes hikers on a wilderness journey through towering pines, bottomlands, and low-lying marshes before terminating twenty miles to the north at Neches Bluff Overlook. Crockett’s relaxed hometown atmosphere offers the perfect environment for families, singles, and seniors. The city is home to the Camp Street Café, a landmark music venue located in downtown Crockett that features an eclectic selection of Americana music that runs the gamut from country and western to rhythm and blues, bluegrass, and folk. Crockett hosts a number of outstanding festivals and special events each year, including the World Championship Fiddlers Festival, held each June in Davy Crockett Park, and the Myrtis Dightman Hall of Fame Rodeo, held annually at the Porth Agriculture Arena each September. 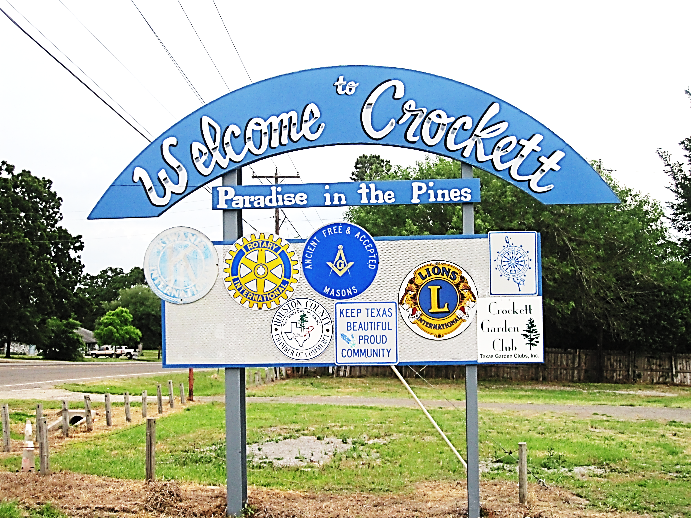 Situated at the crossroads of U.S. Route 287 and State Routes 7, 19, and 21, Crockett is at the heart of the action in Houston County, Texas!